We’ve been reporting on the Sweden Democrats since 2008 or so. Despite their persecution by EXPO and other government thugs, they’ve hung on like oak leaves in winter — past all reasonable hope. 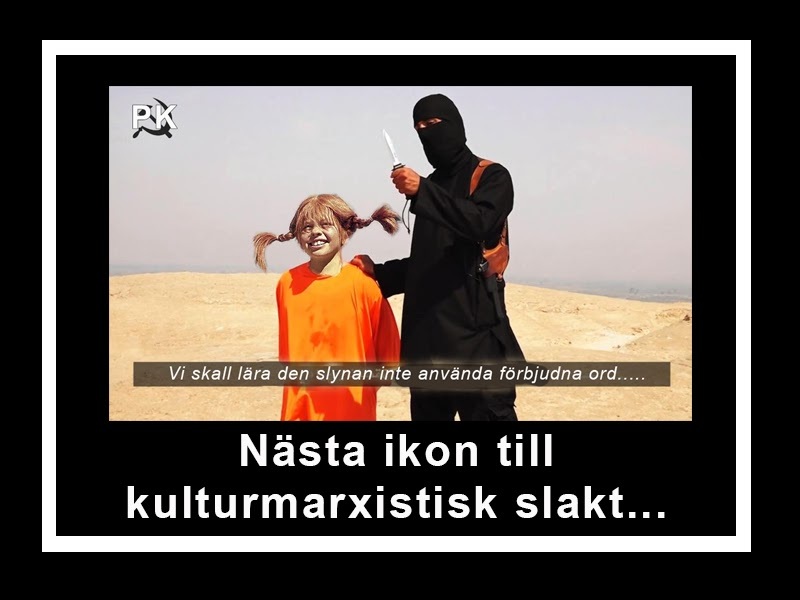 This entry was posted in Counterjihad, Culture Wars, Europe by Dymphna. Bookmark the permalink. The problem in Sweden, as in many other European countries, is the multi-party coalition system, which binds many potential voters for the Sweden Democrats to their traditional parties. Many of these voters silently hope that “their” parties will take over the key points of the SD, so that they don’t have to face the ultimate truth and take the (psychologically) huge step of voting for a party which is (still) ostracized in the political landscape. By doing so, they would face the painful choice of being ostracized oneself as well in ones social settings, or lying about ones electoral choice, which also feels uncomfortable for many honest Scandinavians. The Americans and Britons have a winner takes it all system, which made Trump possible. Southern and Central-Eastern en Europeans do not have such a hang-up about political correctness, and can create popular fronts which break the traditional ideological fault lines, by uniting patriotism and social justice. The Nordic countries, especially Sweden, face more cultural obstacles. Hope there will be time enough to turn the tide. As I understand it, the Swedish people have a certain mindset and possess a strong belief in fairness and what is right. I am sure they are finally coming to the understanding that the Muslim immigrants have zero belief in fairness and what is right. One only has to look at the enormous unrest they cause wherever they are. Added to that, there are so many incidents all over the West where they have literally scammed the government out of millions with their fraudulent activities. It is more than clear to see that they have no desire to integrate or be of any benefit whatsoever to their host country. I do sincerely hope that by the time the Swedes come to vote they will understand that this will be one of the most important votes they will have. It has given me joy to see this video. Sweden and Europe are not done for yet. One may recall that in Pres Reagan’s years in office, our intelligence agencies were quite certain that the USSR was rock solid, and were reportedly very surprised to learn that the Russians did not care for their soviet leaders either. The end would be rapid in historical terms. It ain’t over yet. Best not to give up on Europeans too quickly. This video is subtitled in English. It is darkly funny. Pippi Longstocking, are you still there? It sure is more enyouable. Since I live here now I also got the brochure. It is so strenuously nondesript in any mention of the possible enemy that you get the eerie feeling its authors know exactly what they are talking about. And they know that everybody knows they can’t mention it. I also haven’t experienced any other country, and I’ve been to a few including real dictatorships, where there is such a strong difference between published opinion and public opinion. It’s the deluded do-gooders that dominate the public image, yes, but the “normal” folks pretty much walk making a fist in their pockets most of the time. The Swedes also do have a proven capacity for making radical decisions when necessary. For instance, a little while back they had this program of “integration guides” where they employed immigrants to help the new ones. When they discovered massive corruption and coterie among those to the extent of it being unfixable by just prosecuting a few, the program was halted abruptly and thousands lost their job literally overnight. Never mind they could have known and avoided it in the first place, but they did recognize the fact then and there. They can snap and go whole hog when they reach their boiling point. It’s just that this threshold is pretty high and the question is will they get there in time where the really big issues are concerned. It’ll be an interesting election to watch. I well remember 10 years ago none of the pundits would give them any chance of ever getting into government. Their time seems to have come.